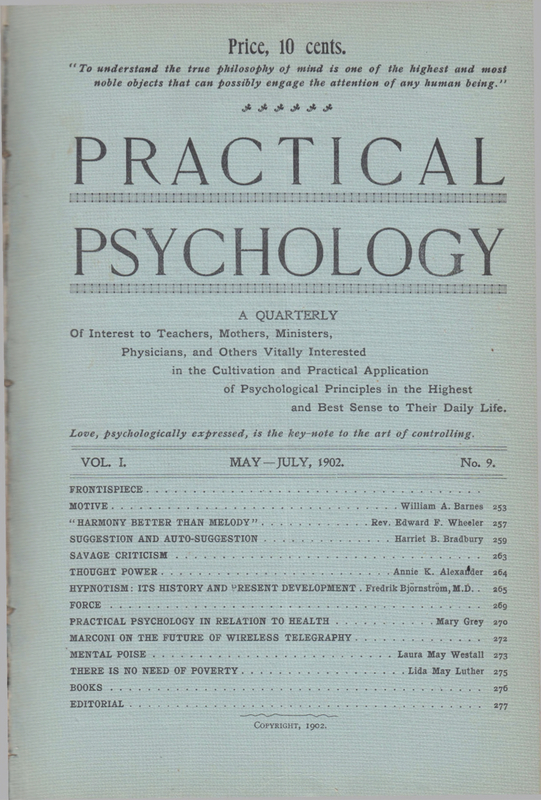 A Quarterly Magazine Devoted to Personal Magnetism and Psycho-Physical Culture / A Quarterly Of Interest to Teachers, Mothers, Ministers, Physicians, and Others Vitally Interested in the Cultivation and Practical Application of Psychological Principles in the Highest and Best Sense to Their Daily Life / A Quarterly Magazine devoted to Personal Magnetism, Electro, Chromo, and Suggestive Therapeutics, and Psychic Development. 1/1, May-July 1900-1/9, May-July 1902. 24 pp., 35 cents a year. Noted in Now, 1902, as "one of the cleanest and most sensible of journals in its line." 35 cents a year. Barnes was one of the principal forerunners of what became the "practical psychology" trend in New Thought, which was based on the application of suggestion to the amelioration of the problems of daily life, manipulating the conscious mind and the body to influence the unconscious mind. He was the President of the Boston College of Practical Psychology (Incorporated) whose curriculum embraced "Practical-Psychology, Psycho-Physics, Psycho-Therapeutics, Psycho-Sociology" and offered classes and individual and correspondence instruction. He was the author of Personal Influence (Practical Psychology) an Aid to Health, Success and Happiness (1906) and Psychology, Hypnotism, Personal Magnetism, and Clairvoyance (1898). Contributions by Barnes on the likes of "Motive" and by a variety of unknown New Thought authors, mainly women. Barnes intermingled his primary emphasis on practical psychology with "psychic science," telepathy, clairvoyance, and personal magnetism, and the like. Harvard University; National Library of Medicine; BL; University of North Carolina at Chapel Hill.